Encouraged by the breathtaking performances of its drivers and riders at the Caribbean Motor Racing Association (CMRA) opening Meet at Bushy Park in Barbados, Guyana will be sending a strong six-man contingent to the second leg of the Series which will be staged, at the Wallerfield Circuit in Trinidad and Tobago (T&T) on Sunday. 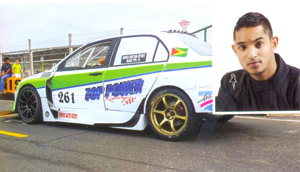 According to Chairman of the CMRA Guyanese Ray Rahaman, the touring party will include current points’ leader Canada-based Kristain Jeffrey, who along with Danny Persaud and Rameeze Mohamed will compete in the Group 4 category, while Group 2 drivers Shairaz Roshandin, Chet Singh and John Joseph complete the team. He said while the team will not have the presence of experienced drivers such as Kevin Jeffrey, Andrew King and Mark Vieira he still believes that those chosen to represent this country will be very competitive. Young Jeffrey he disclosed currently holds the new lap record for Bushy Park and he is anticipated to do the same at Wallerfield which was also upgraded recently. Jeffrey, who drives a Mitsubishi Evolution IX, was in scorching form as he obliterated his more established counterparts en route to three first places in as many starts for a maximum 75 points. Danny Persaud, who pilots a Mazda Miata, sits in 8th position with 16 points, while Mohamed’s Toyota Starlet is yet to score a point. In the Group 2 Division, both Roshandin and Singh are locked together in the fourth spot overall on 28 points, while Joseph will have to improve remarkably to feature as a challenger for the championship title. All three drivers in this category drive Honda Civics. In the overall points’ standing, Guyana with 172 points trail Barbados 203, while Jamaica lies third on 151 and T&T in the cellar on 34. Rahaman expressed thanks to Dyna’s Embroidery, the Company that supplied the team with their travelling jerseys, Seaboard Marine, which has stepped up once again to make the team’s participation possible and the vibrant and hard working Executive Committee. Meanwhile, Rahaman, who recently returned from the FIA Congress of the Americas, told this newspaper that he was able to initiate an agreement which could see drivers from Latin America come to the Caribbean to compete and according to him this could start as soon as November 16 when Guyana hosts the final leg of the Series, at the South Dakota Circuit. “Currently cars from the Dominican Republic, Haiti and Puerto Rico are eager to come and compete in the Region and our main sponsor Seaboard Marine which has a business presence in those countries has already expressed a willingness to help them get their machines to which ever destination they are confirmed to compete in,” Rahaman stated. Rahaman also revealed that Guyana will be staging a local Meet in September to ascertain competitors’ readiness both in terms of competitiveness and their knowledge and adherence to the new rules which have now been standardised throughout the Caribbean. The CMRA Chairman said he envisages a huge turnout come November and over the next few months the Committee will be working assiduously to ensure that all systems to host a successful final leg of the series are in place.